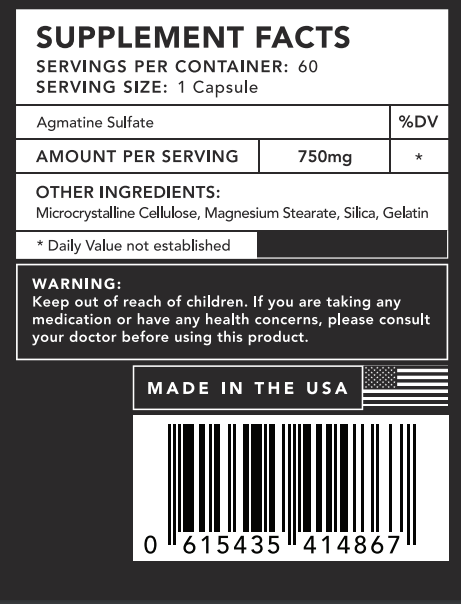 Agmatine Sulfate is a highly potent derivative of L-Arginine synthesized by the Alchemists at Wizard Nutrition to boost the performance of wizards before the battle. The Primary function of Agmatine Sulfate is the coax more power out of every movement, allowing wizards to act purposefully and efficiently. it is also said to raise the pain threshold and calm the mind, improving damage and resistance and recovery rate. supercharge your pumps with eleveated Nitric Oxide levels, and go harder for longer, with the higher pain tolerance and solid endurance capabilities. make every rep count. Agmatine is known for its Nitric Oxide benefits, which are designed to promote blood flow to the muscle and enduce muscle pumps. It is an ideal addition to any pre-workout supplement stack, or it can be taken by itself as a stimulant free pre-workout.